Whether you are moving just one machine or 20 we have the capability to complete the project according to your requirements. When moving heavy industrial machinery there is no place for mistakes. Get free site inspection! Meet one of our plant moving engineers and take advantage of the free technical site survey. We will plan the right way to relocate your machinery, find the potential pitfalls and eliminate them. Should you need electrical or mechanical services our engineers are ready to prove their knowledge and skills. We provide on site machinery maintenance 24/7. Full factory and production lines removals and free consultation. Whether you're moving existing industrial plant and machinery in London or anywhere in the UK, or installing new equipment, our machinery moving company in London provides mechanical removal services across the UK to connect or disconnect water, air and gas utilities. Our qualified factory moving engineers can also design the delivery systems for those services, using applied engineering, industry knowledge and CAD systems to create a blueprint for the installation of pipework, ducting, heating, ventilation, compressed air, air conditioning, extraction systems and other manufacturing networks. Welcome to local machinery Movers London, we are a specialised heavy objects, goods, items and plant relocation firm in with a wide experience of machine relocation and on site positioning. Why not leave it to experts and contact Plant moving London now for a free quote, or for more information. Machinery Movers London are able to provide a complete spectrum of corporate and industrial services including: machine dismantling London, electrical disconnection, machine moving, transportation, cranage, shipping and re-installation, electronic equipment removals. As part of their strategic planning, many companies often review the merits of remaining where they are against the benefits of relocation to another location. The option to move the Business becomes a higher profile issue whenever there is a major change in its business operations and when it embarks on a major reorganisation of a part or whole of its business premises. Over time, another corporate service has been developed by our forklift and crane rental company: machinery removals and transport of any kind. With our own heavy plant moving equipment and experienced personnel, we provide one of the best and high quality machinery removals in the Greater London area and in the UK. All our staff are professionally trained and have experience in dealing with machines and heavy loads. Our forklifts, hoists, cranes and other machinery lifting and moving equipment with the load capacities up to 150 tons are always operated by moving engineers that are well trained . With our heavy items removal equipment, we believe in quality and technology and ensure safe lifting and relocations of single machines and entire production lines. Due to the design of the buildings and the final destination the movement of a machine can be difficult but we are happy to assist and help you with even most difficult and impossible for some companies projects. With specially designed cranes, trucks and other equipment we make it possible that even huge machinery can be lifted, moved and positioned in a small space. For moves inside of the buildings we like to use our chain and rope technicians. 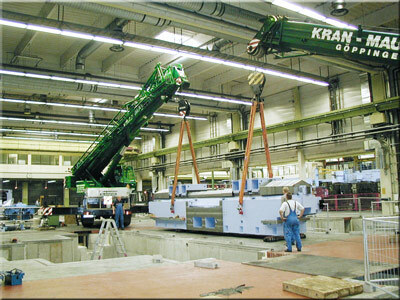 This gives us a better control of the machine and allow us to move it and position by using special winches and slings. Meet one of our machinery and plant engineers in person. Discuss your requirements and get extra piece of mind. The engineer will carry out a quick technical survey and prepare a free no-obligation quote taking in to account the dimensions and weight of each machine, height and width restrictions and other activities that may be necessary to move out, move in and position the plant in the new location. During the meeting our engineer will go trough every step of your machinery relocation. He will give you some good tips and advise on the best removal practices. Once the engineer has completed the survey he will be able to give you an idea of machinery moving costs right on the spot. The final price will be confirmed on a very detailed quote which will be emailed to you within 24 hours from the survey. The machinery moving engineers will answer all your questions and plan the move for you. While moving machinery you may also need our London demolition contractors.